The Utah Senate proved to be friendly territory for a pair of bills that would allow terminally ill people to use marijuana distributed by the state if doctors expect they’ll die within six months. HB195 and HB197 represent the Legislature’s approach to marijuana, a federally illegal cannabis plant that 29 other states have legalized for medical use. SB130, meanwhile, would set up the regulatory framework for businesses to legally sell cannabidiol, or CBD, which unlike its cousin marijuana has no psychoactive ingredients. The marijuana bills had struggled to get out of the House over concerns about flouting federal law. But the pair had a much smoother journey in the Senate. The Senate voted 22-4 in favor of HB195, which would head to the governor after a final, procedural vote. The Senate also voted 22-3 for HB197, which sets up the procedures for the state Department of Agriculture and Food to contract with a private grower and then warehouse approved pot products. Organizers of a populist campaign to legalize marijuana for a much broader list of patients and to allow private growing and dispensing of marijuana products have opposed the legislative measures, saying they don’t go far enough. The House voted 49-20 on Tuesday to approve SB130. The bill would allow businesses — many of whom are already selling CBD in Utah — to do so legally after putting in place testing, labeling and licensing requirements that lawmakers say will protect patients. Lawmakers knew the vote would be close for a plan to create a state-run dispensary supplied with marijuana products for a narrow list of patients. HB197 had already failed on the House floor on Friday, falling short of the required 38 votes to make it to the Senate. But the bill needed to pass if a companion bill, HB195, which did pass on Friday, were to do anything. Some feared the consequences of putting the state out of compliance with federal law on cannabis, an illegal plant that 29 other states have approved for medical use. Others said Utah was taking too small a step toward legalizing marijuana only for patients who are near death, with bills that limit medical marijuana for terminal patients within six months of dying. Rep. Brian King, D-Salt Lake City, thought moving to legalize medical marijuana would have a negative effect on an initiative that would legalize the plant for a much broader list of patients and would allow products from private growers. He had voted in favor of the bill on Friday but voted against it Tuesday. “The Legislature is taking baby steps when the people in the state of Utah make it pretty clear they want us to actually take bigger steps in the direction that they want to go,” King said. The ballot campaign to legalize medical marijuana has collected over 140,000 signatures, 113,000 of which need to be from valid voters in order to qualify for the November election. Rep. Brad Daw, R-Orem, the House sponsor of both marijuana bills, has acknowledged the framework in the bills is narrow. But he told his colleagues it was the right move amid federal uncertainty. HB197 passed after seven representatives who voted against the bill on Friday changed their votes Tuesday. It then cleared the House without a vote to spare. The Senate will take up the bill next, and legislative leaders there say they haven’t paid much attention to the bill. Feb. 9: The Utah House voted on two bills to legalize medical marijuana. Both needed to pass. One didn’t. 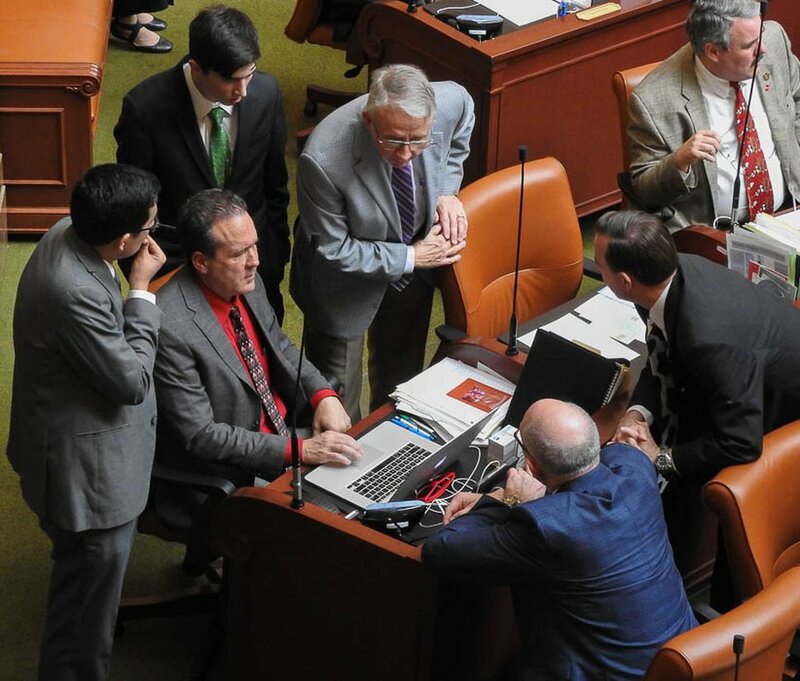 (Trent Nelson | The Salt Lake Tribune) Legislators and staff surround Rep. Brad Daw, R-Orem, after the House narrowly failed to pass HB197, which would have allowed the cultivation of marijuana. Salt Lake City, Friday, Feb. 9, 2018. If you’re in Utah and you’ve got six months left to live, you could ask your doctor if medical marijuana is right for you under a bill the House passed Friday. There’s just nowhere you could buy marijuana legally. The vote leaves what medical marijuana supporters say would be an unworkable law, with a narrow list of patients legally allowed to possess marijuana products but no supply. Then came the vote on HB197, which would have instructed the Utah Department of Agriculture and Food to write rules on growing marijuana and contract with a third-party grower to grow the plant. The agency would then act as warehouser and distributor of the plant that the federal government still considers illegal. The bill failed. Factions emerged among lawmakers on both bills, with some saying they didn’t go far enough to offer patients who should have access to the plant many have grown to view as medically beneficial. Others pointed out the illegal status of the plant and said the state was welcoming trouble passing either bill, which would put the state out of compliance with federal law. Rep. Mike Noel, a Kanab Republican and frequent critic of federal overreach, said by legalizing medical marijuana Utah would be reacting to years of inaction by Congress. Rep. Ray Ward, a Bountiful Republican and family physician, took issue with a late amendment that removed nurses from the medical professionals who could recommend marijuana to their patients in HB195. The bill also capped at 25 the number of patients for whom a doctor could recommend marijuana. “We don’t want to create what we refer to as Dr. Feelgood,” Daw said in reference to the patient cap. Daw acknowledged the bill would be a narrow dip into the marijuana pool for the state of Utah. Other states, including neighbors Colorado and Nevada, have legalized marijuana for recreational use. Arizona and New Mexico allow medical marijuana and both states have discussed legalizing the plant for recreational use. While a narrow plurality of the House voted in favor of HB197, it failed to gather the minimum 38 votes needed to pass under the chamber’s rules. Lawmakers could still revive the bill if someone who voted against the measure moves to do so, and Rep. Mike Winder, R-West Valley City, has said he may do that. Lawmakers are having their own debate on cannabis issues while advocates for a far broader medical marijuana initiative that could be on the November ballot collected 142,000 signatures to put it there, according to DJ Schanz, director of the Utah Patients Coalition. The campaign needs 113,000 valid signatures to qualify for the ballot. Schanz has called Daw’s bills “cannabis theater,” and noted the initiative has language that he said would trump marijuana bills passed by the Legislature this session. “They do little to nothing to give patients access and respite,” Schanz said.